Today I’m sharing a link to a very cool app that is perfect if you find something online but don’t have the time to read it right now (or, if you’re like me you shouldn’t be reading it right now because you have other things to do!). 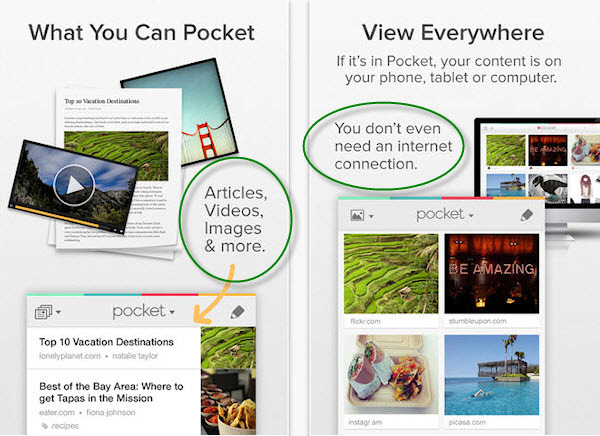 It’s called Pocket and you’ll find it at http://www.getpocket.com. I installed it on my MacBook Pro and I fell in love with it immediately! 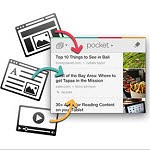 Pocket lets you save anything, yes anything you come across browsing the Internet, so you can read it later. Once you put it in your “pocket” you can easily pull it back up later from your “pocket archive” and watch it (video) or read it (web page). Pocket is cross-platform compatible, so will work across and synch across all your devices – PC, laptop, iPad, iPhone, Android, etc. etc.